I was really tired yesterday and didn't feel much like eating. But Mom said I needed to eat to keep up my strength. So Dad, being thoughtful, ordered a meatball pizza. When Del Mar Pizza found out it was for me, they sent it as a gift! With the way I was feeling, I couldn't eat much, but it was SO delicious. Then I took a long nap and before I knew it was dinner time. Well Dad had another swell idea. Smashburger! I got smashed on Fidoburgers. YUM. Then I was ready for another nap. I wonder what they will tempt me with next! Bear, there is so much love from mom and dad coming in your direction. You have to get better for them. They know how much you love Pizza. Day by day you will get better. In the meantime, enjoy all the attention. I'll keep sending pawwaves of good thoughts in your direction. Bear, I think you to know how much I enjoy all your blogs, looking forward to a new one each day. And your pix are spectacular. (I don't say that lightly!) Even tho these are difficult days M&D are taking wonderful care of you w/lots of love. You must get well - so many anipals & human fans love you so much. DON'T FORGET TO EAT. Bear, we are thinking about you every day! 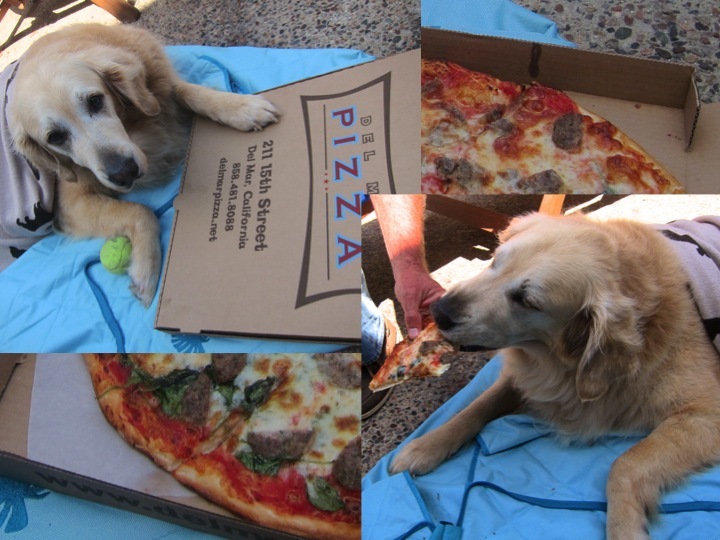 I hope the pizza n fido burgers r tempting you so you can regain your strength so you can go to the beach! Lots of love, my pal! You got your yummy favorites. Even if you only ate a little bit, that's ok. You can eat more after your nap. Feel better soon Bear - I hope you enjoyed those yummy meals. YOu are so lucky! My pups never get pizza OR burgers!